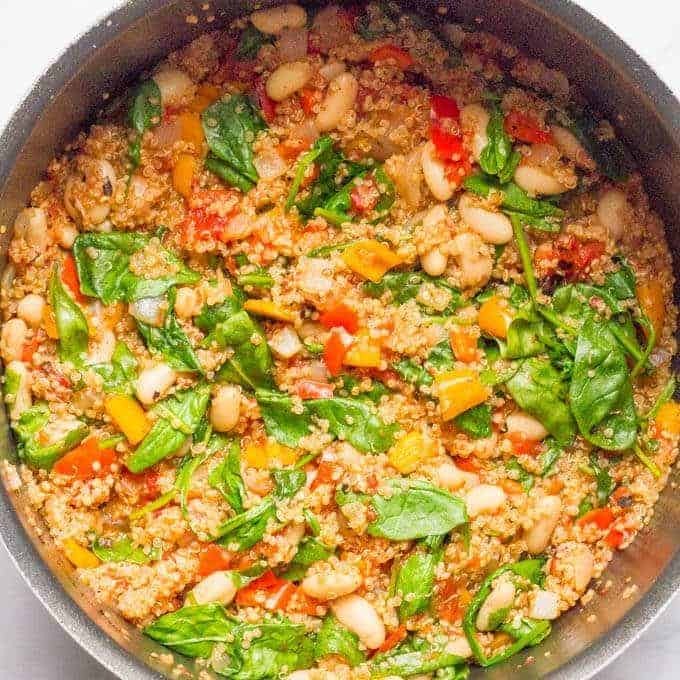 Quinoa cannellini beans skillet is a quick and easy one-pot vegetarian meal with rich Italian flavors! Hi friends! I’m happy to be waking up at home this morning and getting snuggles from my kiddos, but my heart is aching a little not to be in D.C.
Today’s the Women’s March on Washington and some of my Northwestern friends made the trip for it. We’d all done a similar march together when we were in school – drove about 15 hours from Chicago to D.C. in a van, playing music and being silly the whole way. It was a fabulous weekend, so inspiring and so meaningful. Anyway, I’m popping in on a weekend for this month’s Recipe Redux challenge. Given that it’s January, we were challenged to come up with a budget-friendly meal. 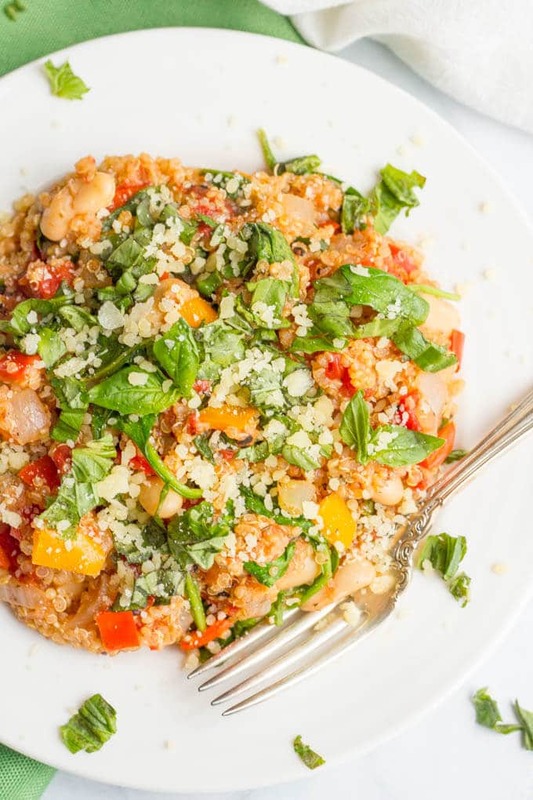 I immediately thought of this quinoa cannellini beans skillet dinner that we’ve been eating as a meatless Monday vegetarian option. 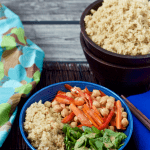 It’s a quick and easy one-pan meal that’s gluten-free and vegan (if you leave off the Parmesan cheese or substitute nutritional yeast). 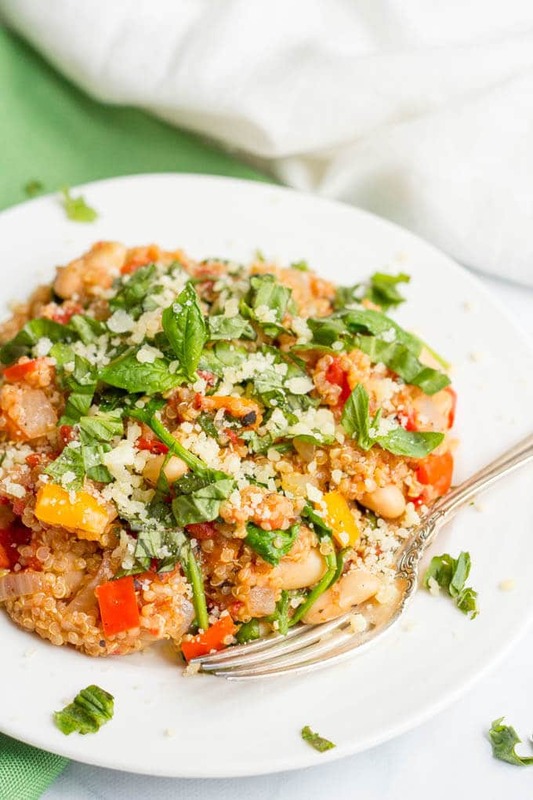 It’s light but hearty with the protein from the quinoa and the creamy, richness of the cannellini beans and lots of Italian flavor throughout. The can of diced tomatoes that cook with this add a lot of depth and richness, as does the Parmesan cheese I serve it with. And the fresh basil at the end brightens up the whole dish and gives it a shot of freshness. Simple ingredients but big impact. Red and orange bell peppers can be expensive if not on sale. 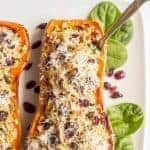 I try and get mine at Trader Joe’s but I also will buy the bag of small sweet peppers and use those for this recipe. It’s lots cheaper. I never buy actual baby spinach (again, unless I’m at Trader Joe’s). I buy a bag of regular spinach. It works just as well for everything I’ve ever substituted it for and it’s less expensive. The leaves are slightly bigger and sometimes you have to tear off a big stem, but that’s the only difference. I like to buy the basil plants at the grocery store and keep them in a glass with some water. It lasts longer and if you’re lucky, you can get it to grow. As for substitutions – cause you know I like to give you options! 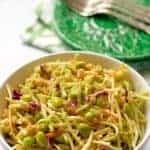 – you can substitute fresh parsley for the basil if you prefer. And you can add 1/4 teaspoon of red pepper flakes to make it a bit spicy. You could also use white Northern beans but I really prefer the creamy cannellini beans here. Add onion and bell pepper and sauté until softened, about 5 minutes. Add garlic and cook another 30 seconds. 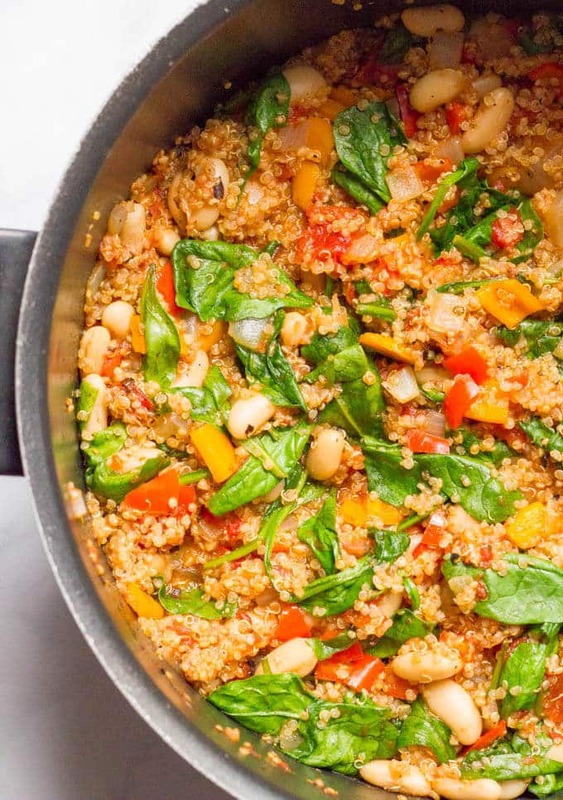 Add quinoa, seasonings, tomatoes and vegetable broth and broil to a boil. 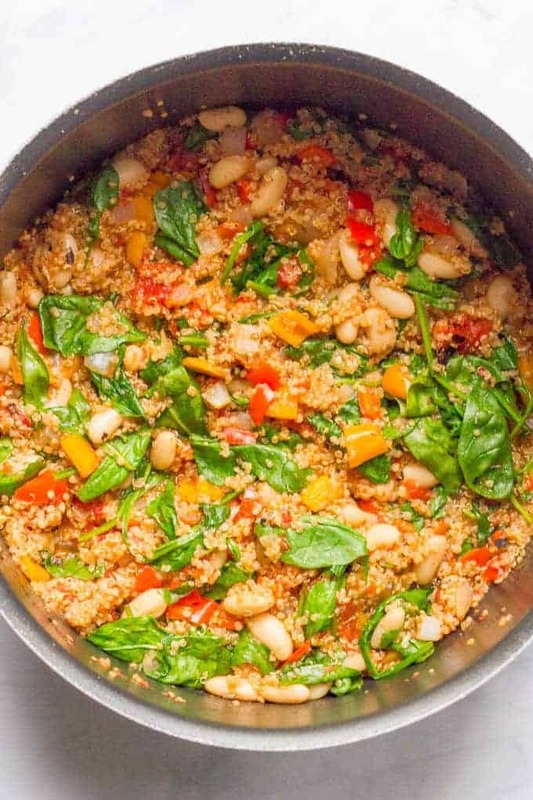 Cover the pot, reduce heat to low and simmer for 15-18 minutes, until quinoa is cooked through and the liquid is mostly absorbed. Stir in cannellini beans and spinach until warmed through and spinach is slightly wilted, 2-3 minutes. Serve hot, sprinkled with fresh basil and Parmesan cheese, if desired. You can substitute fresh parsley for the basil if you prefer. You can add 1/4 teaspoon of red pepper flakes to make it a bit spicy. And you can certainly add some rotisserie chicken if you don’t want this as a vegetarian meal. This is totally my kind of meal. 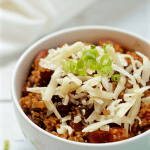 Love easy one pot meals full of nutrition and flavor! I subscribe to your news letter. 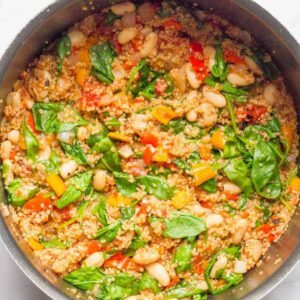 Under the “One pot quinoa cannellini beans skillet recipe, i finf the ingredients listed and a serving tip but no recipe! Please help. Typo error, sorry! I ‘find’….. Thank you so much for pointing that out Aruna! The instructions somehow got completely deleted. I’ve added them back into the recipe card so you should be able to see it now. Hope you give this a try! Shut the door!! How can you go wrong with all these great ingredients. Quinoa, spinach and chicken is my favorite. Made it today and love, love, love it. Keep recipes like these coming. Healthy and delicious. High five!! Wow! That’s a lot of spinach! 34 cups? Haha, sorry Joanna! I just switched to a new recipe plugin and that must have been messed up in the transition. It should be 3-4 or 3 to 4 cups of spinach (I just grab big handfuls), not 34 cups! I’ve updated the recipe card on this recipe and let the tech team know so they can make sure that doesn’t get stripped out again. Thanks for letting me know! Hello and Thank you for your recipe! My family really enjoyed this dish. 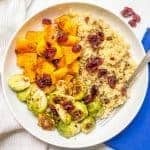 We added chopped raw organic pumpkin seeds in with the quinoa when cooking for added nutrition and texture I also added a tad more salt and water to compensate for the pepitas (pumpkin seeds). May you and your family be blessed. I’m so happy to hear you enjoyed it Aron! Love the sound of the pumpkin seeds in this too! Healthy and filling! Glad I live alone so I can have all the leftovers for me! I love that I had most of the ingredients already in the house so that made it really easy to make! 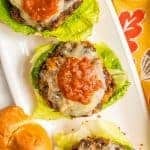 I chose to add the basil and it gave it a great refreshing Italian flavor!